Brixham is one of the last working, fishing, harbours in England. The boats come in and out continually through the day, seagulls screeching and wheeling overhead. Much of each haul is sold there and then in the spanking new fish market or through the myriad traditional fish and chips joints along the water front. What joy to find yourself there on a sunny long weekend, who needs plane tickets abroad when England has magical places like this in the height of summer. We were lucky enough to catch a ride on one of the boats, skippered by retired trawlerman, Dennis, one bright July morning. With flasks of strong coffee and a bunch of bananas, we were packed and ready to go. Dennis, in his early 80s told us that when he was starting out the cliffs and the skies above teamed with seabirds of all kinds and at times the sea appeared ‘to boil with herring or mackerel’. Such abundance has been lost, but given the little protection, can so quickly return. Ordinarily we would have fished for mackerel (always hopeful of spotting dolphins and seals). But Dennis has crab pots too. This is our kind of fishing, each crab pot hauled up from the bottom, thick with seaweed and barnacles, contain at least one fat cross looking- crab. They are as quick as lightning, with surprisingly powerful claws, so extracting them from the pot is a skill- usually with much squeals and laughter from us! Arriving back into the harbour after less than two hours, we parted company with Dennis replete with four live crabs. What a fantastic feeling that is. We have never loved the act of killing anything, and boiling a living creature alive is just one step too far. So, these crabs died from cutting the ventral nerve cord, which is done by stabbing them in the middle of their bellies, before plunging into a boiling pan of water. Weighing up on the boat what we were going to make with our crabs- fresh and simple with a lemony aioli and rocket? Spiced Thai crab cakes? Or maybe even the labour of love- a crab bisque with charred sour dough? But we simply couldn’t deny our favourite option, thank god, we both have the same desert island dish/last supper- crab pasta! Yummmm. The amount of times we have ordered this in restaurants or made it at home, we never get bored of this dish. 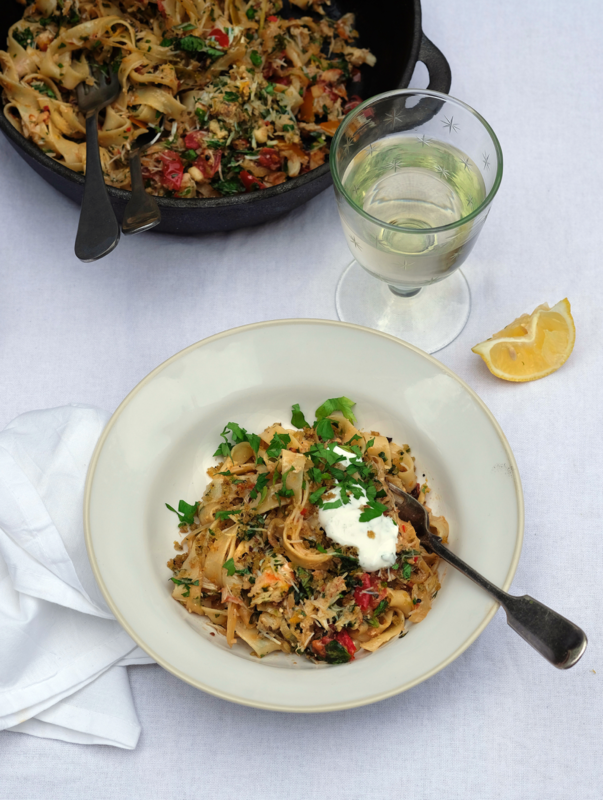 Always with little tweaks here and there, but mainly with the classic River Café one as the base- sautéed fennel and garlic with crushed fennel seeds and dried chilli. The preparation of a crab… once you are done with the intensity of killing and cooking your crab, then comes the battle of extracting the sweet flesh from it, literally in parts with a knitting needle. Thank god reputable suppliers, you trust, pot ready-prepared shellfish. But all the same this was a wonderful moment, from early morning on a boat to a late lunch, sitting outside and drinking a cold glass of wine. The whole production made it all the worth, and especially the visceral experience of sitting outside seeing and smelling the sea. · In a big pan add a generous amount of olive oil and add the sliced garlic, crushed chilli and fennel seeds and sauté over a low heat for a few minutes, add the spring onions and sliced fennel- sauté for a further 5 minutes. Add the tomatoes and the wine and turn up the heat for a few more minutes until most of the wine and cooked off. · In a bowl mix the fresh crab with the chopped herbs (reserve some parsley), the lemon zest and juice and plenty of salt and pepper. · Put your pasta in and cook to the instructions, leaving a little al dente. · In a different pan add a small tablespoon of butter, add the anchovy, fennel seeds and garlic cook over a medium heat until the anchovy breaks down and then add the crumbs. Keep stirring until they crisp up, add then add the lemon zest and a big pinch of finely chopped parsley. Set aside . · Mix in a bowl crème fraiche with half a lemon juice and salt. · Heat the fennel mixture and add the pasta, douse in a little more olive oil and add the crab and take off the heat. · Serve with a dollop of crème fraiche and a generous sprinkling of the crumbs, we like to add more chopped herbs to the top.